The current state of anti-Russia hysteria is reminiscent of earlier dark chapters of American history, including the rush to war in Iraq of the early 2000s and McCarthyism of the 1950s, Patrick Henningsen observes. If there’s one thing to be gleaned from the current atmosphere of anti-Russian hysteria in the West, it’s that the US-led sustained propaganda campaign is starting to pay dividends. It’s not only the hopeless political classes and media miscreants who believe that Russia is hacking, meddling and poisoning our progressive democratic utopia – with many pinning their political careers to this by now that’s it’s too late for them to turn back. As it was with Iraq in 2003, these dubious public figures require a degree of public support for their policies, and unfortunately many people do believe in the grand Russian conspiracy, having been sufficiently brow-beaten into submission by around-the-clock fear mongering and official fake news disseminated by government and the mainstream media. What makes this latest carnival of warmongering more frightening is that it proves that the political and media classes never actually learned or internalized the basic lessons of Iraq, namely that the cessation of diplomacy and the declarations of sanctions (a prelude to war) against another sovereign state should not be based on half-baked intelligence and mainstream fake news. But that’s exactly what is happening with this latest Russian ‘Novichok’ plot. As with past high-profile western-led WMD allegations against governments in Syria and Iraq (the US and UK are patently unconcerned with multiple allegations of ‘rebel’ terrorists in Syria caught using chemical weapons), an identical progression of events appears to be unfolding following the alleged ‘Novichok’ chemical weapon poisoning of retired British-Russian double agent Sergei Skripal and his daughter Yulia in Salisbury, Wiltshire on March 4. Despite a lack of evidence presented to the public other than the surreptitious “highly likely” assessments of British Prime Minister Theresa May and Foreign Secretary Boris Johnson, President Trump once again has caved into pressure from Official Washington’s anti-Russian party line and ordered the expulsion of 60 Russian diplomats – whom he accused of being spies. Trump also ordered the closure of the Russian consulate in Seattle, citing speculative fears that Russia might be spying on a nearby Boeing submarine development base. It was the second round of US expulsions of Russian officials, with the first one ordered by the outgoing President Obama in December 2016, kicking out 35 Russian diplomats and their families (including their head chef) and closing the Russian Consulate in San Francisco, with some calling it “a den of spies”. It’s important to understand how this week’s brash move by Washington was coordinated in advance. The US and the UK are relying on their other NATO partners, including Germany, Poland, Italy, Canada, the Czech Republic, the Netherlands, Estonia and Lithuania – to create the image of a united front against perceived ‘Russian aggression.’ As with multilateral military operations, multilateral diplomatic measures like this are not carried out on a whim. “The United States takes this action in conjunction with our NATO allies, and partners around the world in response with Russia’s use of a military grade chemical weapon on the soil of the United Kingdom — the latest in its ongoing pattern of destabilizing activities around the world,” the White House said. The second issue with the Trump’s diplomatic move against Russia is that it extends beyond the territorial US – and into what should be regarded at the neutral zone of the United Nations. As part of the group of 60 expulsions, the US has expelled 12 Russian diplomats from the United Nations in New York City. While this may mean nothing to jumped-up political appointees like Nikki Haley who routinely threaten the UN when a UNGA vote doesn’t go her way, this is an extremely dangerous precedent because it means that the US has now created a diplomatic trap door where legitimate international relations duties are being carelessly rebranded as espionage – done on a whim and based on no actual evidence. By using this tactic, the US is casting aside decades of international resolutions, treaties and laws. Such a move directly threatens to undermine a fundamental principle of the United Nations which is its diplomatic mission and the right for every sovereign nation to have diplomatic representation. Without it, there is no UN forum and countries cannot talk through their differences and negotiate peaceful settlements. This is why the UN was founded in the first place. Someone might want to remind Nikki Haley of that. On top of this, flippant US and UK officials are already crowing that Russia should be kicked off the UN Security Council. In effect, Washington is trying to cut the legs out from a fellow UN Security Council member and a nuclear power. This UNSC exclusion campaign been gradually building up since 2014, where US officials have been repeated blocked by Russia over incidents in Syria and the Ukraine. Hence, Washington and its partners are frustrated with the UN framework, and that’s probably why they are so actively undermining it. Also, consider the fact that both the US and Russian have military assets deployed in Syria. How much of the Skripal case and the subsequent fall-out has to do with the fact that US Coalition and Gulf state proxy terrorists have lost their hold over key areas in Syria? The truly dangerous part of this equation is that the illegal military occupation by the US and its NATO ally Turkey of northeastern Syria is in open violation of international law, and so Washington and its media arms would like nothing more than to be history’s actor and bury its past indiscretions under a new layer of US-Russia tension in the Middle East. “This sworn Court evidence direct from Porton Down is utterly incompatible with what Boris Johnson has been saying. The truth is that Porton Down have not even positively identified this as a ‘Novichok’, as opposed to “a closely related agent”. 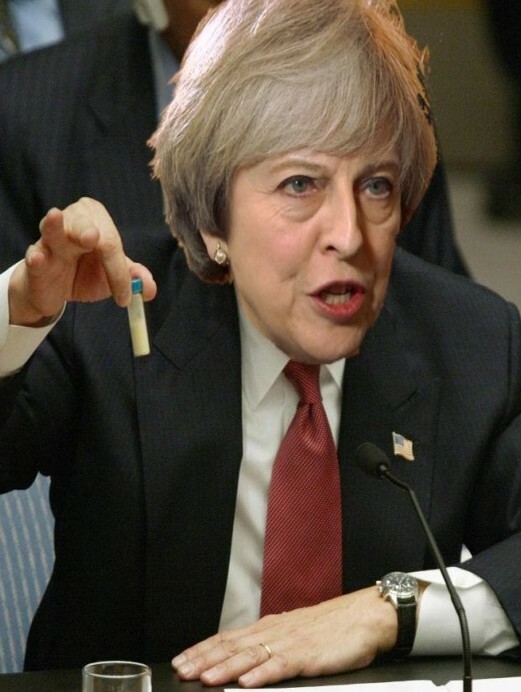 Even if it were a ‘Novichok’ that would not prove manufacture in Russia, and a ‘closely related agent’ could be manufactured by literally scores of state and non-state actors. Murray has been roundly admonished by the UK establishment for his views, but he is still correct to ask the question: how could UK government leaders have known ‘who did it’ in advance of any criminal forensic investigation or substantive testing by Porton Down or an independent forensic investigation by the Organization for the Prohibition of Chemical Weapons (OPCW)? Murray is not alone. A number of scientists and journalists have openly questioned the UK’s hyperbolic claims that Russia had ordered a ‘chemical attack’ on British soil. In her recent report for the New Scientist, author Debora MacKenzie reiterates the fact that several countries could have manufactured a ‘Novichok’ class nerve agent and used it in the chemical attack on Russians Sergei and Yulia Skripal in Salisbury. “I doubt they have reference chemicals for forensic analysis related to Russian CW agents,” says Trapp. It should be noted that a substantial amount of evidence points to only two countries who are the most active in producing and testing biological and chemical weapons WMD – the United States and Great Britain. Their programs also include massive ‘live testing’ on both humans and animals with most of this work undertaken at the Porton Down research facility located only minutes away from the scene of this alleged ‘chemical attack’ in Salisbury, England. The UK police have now released a statement claiming that the alleged ‘Novichok’ nerve agent was somehow administered at the front door of Sergie Skripal’s home in Wiltshire. This latest official claim effectively negates the previous official story because it means that the Skripals would have been exposed a home at the latest around 13:00 GMT on March 4th, and then drove into town, parking their car at Sainsbury’s car park, then having a leisurely walk to have drinks at The Mill Pub, before for ordering and eating lunch at Zizzis restaurant, and then finally leaving the Zizzis and walking before finally retiring on a park bench – where emergency services were apparently called at 16:15 GMT to report an incident. Soon after, local police arrived on the scene to find the Skripals on the bench in an “extremely serious condition.” Based on this story, the Skripals would have been going about their business for 3 hours before finally falling prey to the deadly WMD ‘Novichok’. From this, one would safely conclude that whatever has poisoned the pair was neither lethal nor could it have been a military grade WMD. Even by subtracting the home doorway exposure leg of this story, the government’s claim hardly adds up – as even a minor amount of any real lethal military grade WMD would have effected many more people along this timeline of events. Based on what we know so far, it seems much more plausible that the pair would have been poisoned at Zizzis restaurant, and not with a military grade nerve agent. When this story initially broke, we were also told that the attending police officer who first arrived on the scene of this incident, Wiltshire Police Detective Sgt. Nick Bailey – was “fighting for his life” after being exposed to the supposed ‘deadly Russian nerve agent’. As it turned out, officer Bailey was treated in hospital and then discharged on March 22, 2018. To our knowledge, no information or photos of Bailey’s time in care are available to the public so we cannot know the trajectory of his health, or if he was even exposed to the said “Novichok’. While Britain insists that it has ‘irrefutable proof’ that Russia launched a deadly nerve-gas attack to murder the Skripals, the facts simply do not match-up to the rhetoric. It’s important to note that as far as public perceptions are concerned, the official Skripal narrative has been built directly on top of the Litvinenko case. The media mythos was reinforced in 2016, when a British Public Inquiry headed by Sir Robert Owen accused senior Russian officials of ‘probably having motives to approve the murder’ of Litvinenko. Again, this level of guesswork and speculation would never meet the standard of an actual forensic investigation worthy of a real criminal court of law, but so far as apportioning blame to another nation or head of state is concerned – it seems fair enough for British authorities. Zakharova highlighted the fact that two key witnesses in the case – Litvinenko’s chief patron, a UK-based anti-Putin defector billionaire oligarch named Boris Berezovsky, and the owner of Itsu restaurant in London’s Mayfair where the incident is said to have taken place, had both suddenly died under dubious circumstances. The British authorities went on to accuse two Russian men in the Litvineko murder – businessman Andrey Lugovoy and Dmitry Kovtun. Both have denied the accusations. Despite the lack of any real evidence, the United States Treasury’s Office of Foreign Assets Control blacklisted both Lugovoi and Kovtun, as well as Russian persons Stanislav Gordievsky, Gennady Plaksin and Aleksandr I. Bastrykin – under the Magnitsky Act, which freezes their assets held in American financial institutions, and bans them from conducting any transactions or traveling to the United States. “My father and I are sure that the Russian authorities are not involved. It’s all a set-up to put pressure on the Russian government,” said Litvinenko to the Mirror newspaper, and that such reasoning can explain why the UK waited almost 10 years to launch the inquiry his brother’s death. Maxim also said that Britain had more reason to kill his brother than the Russians, and believes that blaming Putin for the murder was part of a wider effort to smear Russia. Following the police investigation, Alexander’s father Walter Litvinenko, also said that he had regretted blaming Putin and the Russian government for his son’s death and did so under intense pressure at the time. With so many questions hanging over the actually validity of the British state’s accusations against Russia, it’s somewhat puzzling that British police would say they are still ‘looking for similarities’ between the Skripal and Litvinenko cases in order to pinpoint a modus operandi. Historically speaking, in the absence of any real mandate or moral authority, governments suffering from an identity crisis, or a crisis of legitimacy will often try and define themselves not based on what they stand for, but rather what (or who) they are in opposition to. This profile suits both the US and UK perfectly at the moment. Both governments are limping along with barely a mandate, and have orchestrated two of the worst and most hypocritical debacles in history with their illegal wars in both Syria and Yemen. With their moral high-ground a thing of the past, these two countries require a common existential enemy in order to give their international order legitimacy. The cheapest, easiest option is to reinvigorate a framework which was already there, which is the Cold War framework: Reds under the bed. The Russian are coming, etc. It’s cheap and it’s easy because it has already been seeded with 70 years of Cold War propaganda and institutionalized racism in the West directed against Russians. If you don’t believe me, just go look at some of the posters, watch the TV propaganda in the US, or read about the horrific McCarthyist blacklists and political witch hunts. I remember growing up in America and being taught “never again” and “we’re past all of that now, those days of irrational paranoia are behind us, we’re better than that now.” But that madness of the past was not a fringe affair – it was a mainstream madness, and one which was actively promoted by government and mainstream media. But from an international law perspective, can May’s ‘highly likely’ assurances really be enough to position the west on war footing with Russia? When Labour leader Jeremy Corbyn asked these same fundamental questions on March 14th, he was shouted down by the Tory bench, and also by the hawkish Blairites sitting behind him. 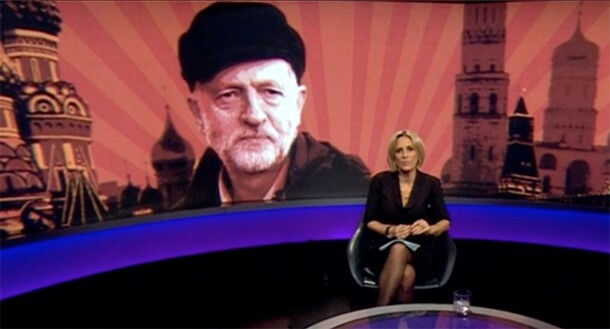 Afterwards, the British mainstream press launched yet another defamation campaign against Corbyn, this time with the UK’s Daily Mail calling the opposition leader a “Kremlin Stooge”, followed by British state broadcaster the BBC who went through the effort of creating a mock-up graphic of Corbyn in front of the Kremlin (pictured above) apparently wearing a Russian hat, as if to say he was a Russian agent. It was a new low point in UK politics and media. 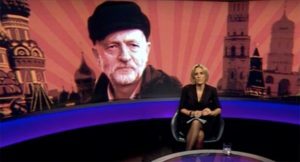 Considering the mainstream media’s Corbyn smear alongside the recent insults hurled at Julian Assange by Tory MP Sir Alan Duncan who stood up in front of Parliament and called the Wikileaks founder a “miserable worm”, what this really says is that anyone who dares defy the official state narrative will be beaten down and publicly humiliated. In other words, dissent in the political ranks will not be tolerated. It’s almost as if we are approaching a one party state. As with T2ony Blair’s WMD’s in 2003, the British public are meant to take it on faith and never question the official government line. And just like in 2003, the UK has opened the first door on the garden path, with the US and its ‘coalition’ following safely behind, shoulder to shoulder. In this latest version of the story, Tony Blair is being played by Theresa May, and Jack Straw is being played by Boris Johnson. On the other side of the pond, a hapless Bush is hapless Trump. Both Blair and Straw, along with the court propagandist Alastair Campbell – are all proven to have been liars of the highest order, and if there were any real accountability or justice, these men and their collaborators in government should be in prison right now. The fact they aren’t is why the door has been left wide open for the exact same scam to be repeated again, and again. Patrick Henningsen is a global affairs analyst and founder of independent news and analysis site 21st Century Wire, and host of the SUNDAY WIRE weekly radio show broadcast globally over the Alternate Current Radio Network (ACR).